Brooklyn Nine-Nine has been renewed for a fifth season by FOX, the network announced today. The show has been a steady performer on FOX, though its audience fell this year. 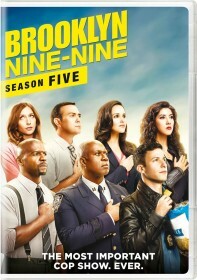 The fact that Brooklyn Nine-Nine is produced by an outside studio, Universal, rather than 20th Century Fox was thought to be a potential mark against the show for renewal. Brooklyn Nine-Nine will now pass the 100 episode mark in its fifth season. The hour-long fourth season finale of Brooklyn Nine-Nine will air Tuesday, May 23 at 8/7c on FOX.